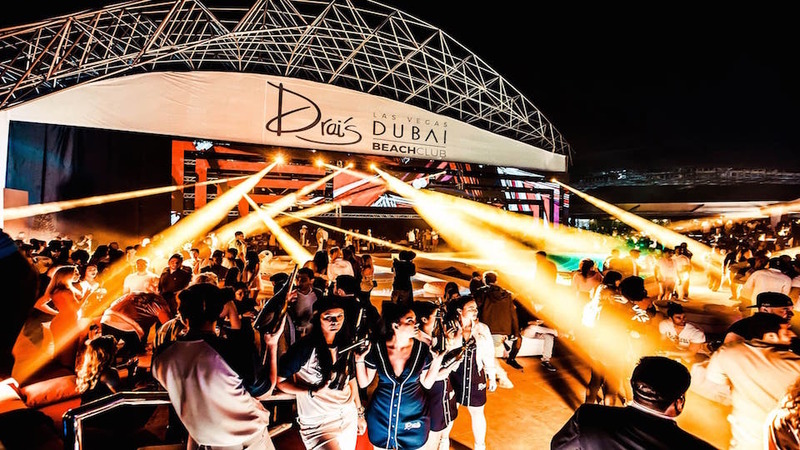 Dubai's Meydan gets its own branch of the famous Drai's nightclub experience, with all the glitz, glamour and energy you expect from this American institution. The state-of-the-art nightclub has the capacity to entertain 4,000 revelers with VIP frills that include bottle service, international DJs and live performances from headlining artists. Dance music caters to hip hop and R&B tastes, with occasional dance/house music nights. Superstars Flo Rida and Nelly were recent performers and the club is positioned to attract major talent from around the world. Drai's Beachclub offers day-or-night partying poolside, in luxurious surroundings that reward guests with five-star service and high-energy revelry. For a truly VIP experience, book a private cabana, each of which includes a view of the stage and a private pool area. Spacious bar areas are optimized to meet demand from a crowd that wants its drinks fast, strong and plentiful. The design allows the kind of close quarters that pumps up a club crowd, while providing spaces to break away from the crush and catch your breath. Soho Garden is part of the same property and offers a welcome and easily accessed refuge if you're looking for a change of pace from the more energetic Drai's.